Janet Rudolph is known as "The Mistress of Mystery." 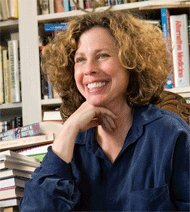 She is the writer/producer for Murder on the Menu®, director of Mystery Readers International, editor of the Mystery Readers Journal, a teacher of mystery fiction, and has been a columnist for most of the mystery periodicals. She is a member of Mystery Writers of America, the International Association of Crime Writers, the British Crime Writers Association, Sisters in Crime, and the American Crime Writers League. She has been on panels at Bouchercon (the World Mystery Convention), Left Coast Crime, and several other mystery conventions. Janet was Fan Guest of Honor at Malice Domestic in Washington, D.C., and an invited participant in international writing conferences in Spain, England, and Cuba. She blogs at Mystery Fanfare and Dying for Chocolate and about team building at TeamBuilding Talk.